Discover what glass beads for your Pandora bracelets are available to purchase online and where to buy them from. There are a lot of different glass beads available to add to your Pandora charm collection and they are all absolutely gorgeous. Glass beads are available to purchase online in a number of different colors. You can purchase American made glass beads, Murano glass beads and other, more inexpensive glass beads for your Pandora Bracelets. Lake Erie Artists offer some simply stunning lampwork glass beads that fit Pandora jewelry and I am in love with a number of the beads they currently have on offer. All of their lampwork glass beads are handmade by artists that are local to Cleveland, Ohio. To me this means great quality, a gorgeous looking bead and a way to help the American economy in a small way. The more commonly known glass beads available are the Murano glass ones. Murano glass is made on the little island of Murano in Venice, Italy and I was very lucky to visit there as a young teen long before they were producing Pandora charms! Murano glass is well known for it’s quality and there are so many different ones to choose from which makes it really hard to stick to only buying a couple at a time! The quality of the Murano glass has been touted since the 10th century which really gives each piece of murano glass a sense of history. Imagine not only wearing a gorgeous looking glass bead, but knowing that you’re actually wearing a piece of history. Sterling Silver Pandora Glass Murano Bead. 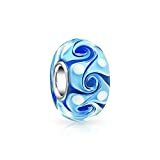 If you’re buying some Pandora charms for a younger person who may not appreciate the charms in quite the same way (one of my nieces loves jewelry, but is constantly losing it – she’s 12 so I guess she gets some leeway J ) then you might want to look at some of the more inexpensive glass beads that fit Pandora. They usually advertise themselves as being Murano style or Lampwork style. Another type of glass bead made for Pandora bracelets is the faceted glass and again this is usually an inexpensive bead. I have a deep purple one in amongst my Pandora charms as it was the shade I wanted and I couldn’t get that shade in the other glass beads I looked at on the day. Have You Discovered the Pandora Trend Yet? Absolutely, I’ve got so many Pandora beads I need a support group! Yes, I’ve only got a few beads so far though. No, it’s just now my style. No, not yet, but I’m thinking about it. I’m fairly new to Pandora charms, but you can follow my discovery into the world of Pandora where I admit I did open the jewelry box on the pages below. 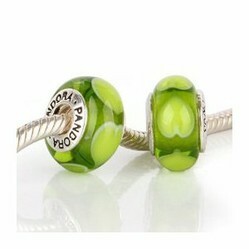 Beautiful Pandora heart charms are a great was to let someone know that you love them. Pandora charms are used to make unique pieces of beautiful jewelry which people around the world are falling in love with. I was just looking at the beads at Hobby Lobby. I didn't find what I wanted though, so I thought I'd go home and look on the Internet. I sure like to click on your ads to look, but I guess I'd get in trouble for that. Do Good Luck Charms Work? Want to make a personalized heirloom charm bracelet but not sure where to begin? Here are 5 steps to help you get started. Do good luck charms work? Some have a very violent and grizzly history. Read here about the origins of the wishbone, rabbits foot, and other supposedly good luck symbols.